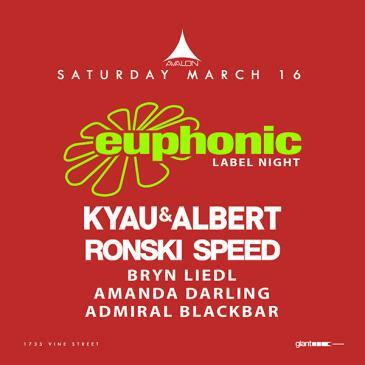 AVALON Hollywood is eager to welcome back the German duo Kyau & Albert on Saturday, March 16th, 2019 for an epic night of eclectic tunes. Made up of Ralph Kyau and Steven Moebius Albert, a singular attribute of the duo is their emotive lyrics which are performed by Albert himself, making them a unique entity in an otherwise saturated community. They showcase an impressive history that spans more than 20 years across hundreds of cities throughout every continent. Renowned for their albums “Here We Are Now” “Worldvibe” and “15 Years,” they are also known for remixing other timeless artists like Dido and Armin Van Buuren. To add to the mix, they started one of the biggest trance labels known today, “Euphonic,” in 1997, that has been pumping out profound, quality artists and music ever since. Supporting Kyau & Albert is none other than Ronski Speed, who was inducted to Euphonic in 1997 and has been with ever since. He brings a boisterous and integral sound to the decks that appropriately supplement that of the headliners. His music has been remixed by the likes of Above & Beyond, Markus Schulz, Tritonal and the king himself, Armin Van Buuren. On opening duties are Bryn Liedl, Amanda Darling and Admiral Blackbar. From mystical and airy to deep cuts, this will be one for the books. Make sure to grab your tickets soon as this will not be one to miss!